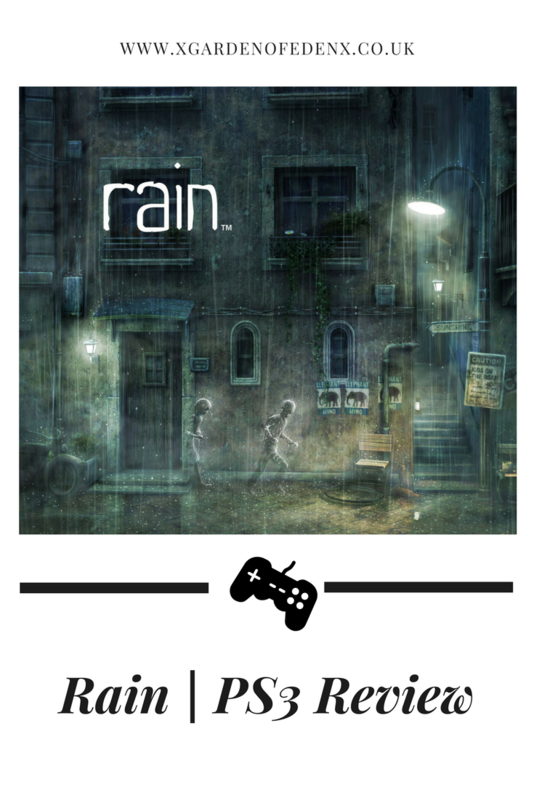 James and I were browsing Playstation Now the other day and came across a game called Rain, it was the one game that stood out to me more so than most of the others and it was a lot cheaper to buy on its own than get the PlayStation Now monthly subscription, the game was less than £3 which was heap for a game, although it was on sale in the PlayStation store, this game is exclusive to PlayStation and only available on PS3, I still have mine and play it whenever I can. 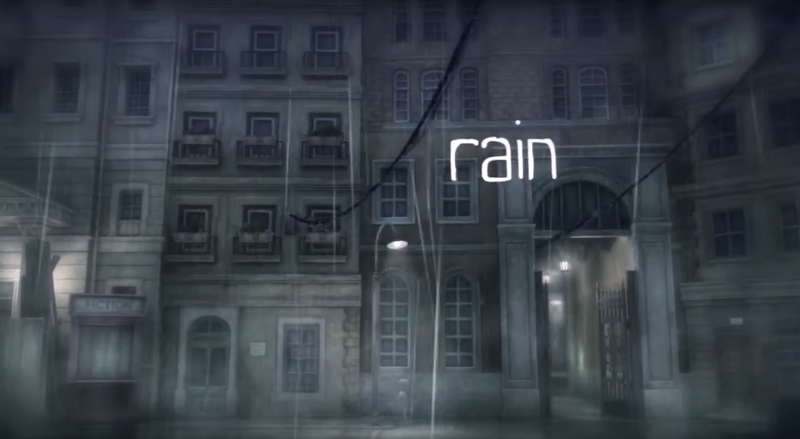 Before I played Rain I read up on it a little so I could get the gist of what it was about I found out that not only is it a book it's also not as old as I thought it was, it was released in 2013 and was only released as disc version was limited to Japan so the only other way to get the game was to digitally download it, it's a shame because I would have loved to of owned the disc version as I enjoyed it so much. Whenever I told people I was playing this they all thought I meant Heavy Rain that's how unheard of this game is but I'm so glad I found it as it's a lovely little adventure game. Rain starts off with a little boy in bed, its an illustrated scene, I get the impression that he is ill, he comes away from his physical form and turns into what I believe is his spirit in order to help a little girl being chased by creatures called the Unknown. 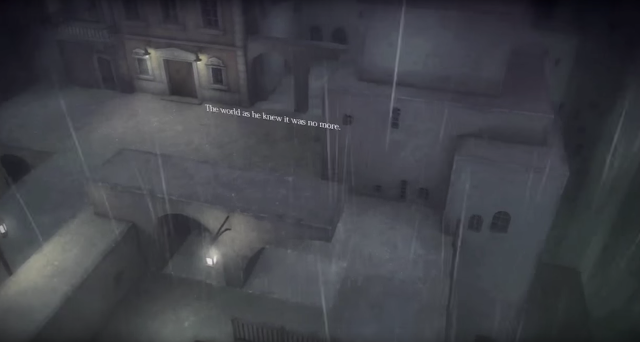 The game takes place in Paris which is easy to tell due to a lot of the graffiti on the walls being in French, whilst following the little girl through the town he comes across an alleyway and day quickly becomes night. H eloses sight of her a number of times and she is always a little distance away from him that is until she finally notices the boy and just before they can reach each other the girl is chased away from a monster, when they finally meet the gil takes the boy to her house, there laying in front of them is the little girl in her physical form, the girl tries her best to wake herself and before she can an unknown burst through the window chasing after the girl who has slowly started to take on her physical form from trying to wake herself, as this was distrupted she quickly turned back into a spirit, you could tell she must have been poorly like the little boy and that's why she has taken on a spirit form. 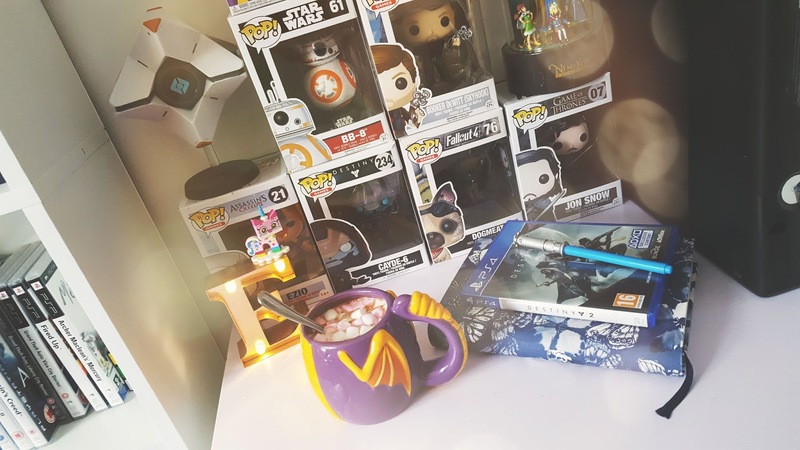 The boy chases after them and the world in which he was in has changed, it was once a simple looking town but now it's turned into a big maze which he had to make his way through in order to get to the girl. Once they find each other they both decided to head to the light, it wasnt far off into the distance but hot on their heels is an unknown, they see the little boys house but before they get a chance to get to it the unknown jumps between them both causing the little girl to run off, the little boy has to save her so he runs after her and tries to help, they are able to escape the unknown until they both finally reach the source of light, a big door with light shining through, they pull one side of the door open which makes the unknown who has caught up with them weak and it collapses, they open both the doors making him, even more, weaker but realise they can't go through the doors, without the rain they were no longer visable so they decide to drag the unknown through the doors and trap him in the other world but as they are closing the second door the unknown pushes through and collapses on to the little boy, the little girl can't save him and leaves him there she runs to his house and bangs and yells on his door as hard as she can to wake the boy in his physical form, it works and the boy gets his physical form back but the little girl is still left in her spirit form alone and sad. The game cuts to an illustrated scene, we see the boy awake and go to find the girl, he retraces his steps from what he could remember to reach her home, stands outside her window and tries to wake her, it works! 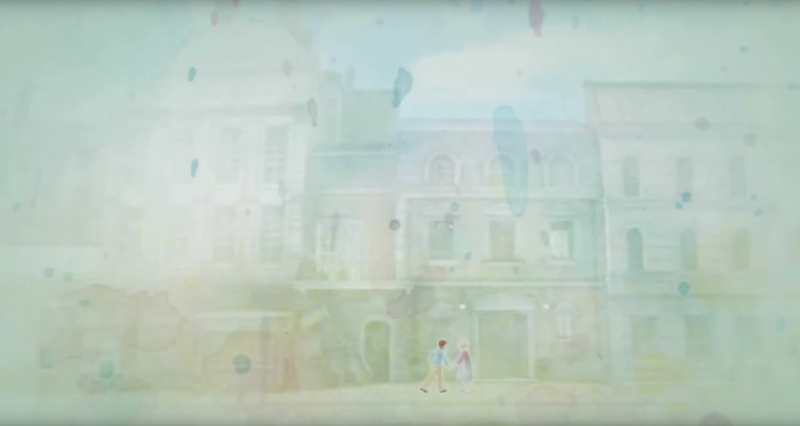 The little boy has saved the girl, the game cuts to both of them outside the little girl's house where they are under a rainbow. Initially I thought these creatures must have been spirits of people trapped in another world and that they were unable to go into the light so instead they would try to destroy those who would try to travel towards it but then I began to think that maybe they are too do with the fact the little boy is ill and he is slowly dying. 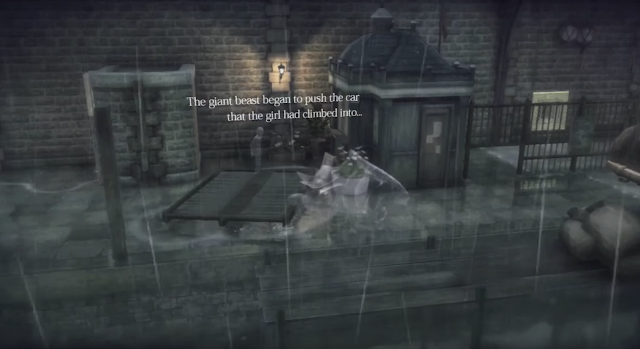 The fact that he could take spirit form and walk in another world made me think of Insidious where the little boy could go into the Astral world and see other spirits, it's a cool concept and I know a lot of people believe in it so maybe this could be whats happening in Rain who knows. As the little boy chases after the girl in order to save her he is also noticed by the Unknown and other little monsters throughout the game which try to destroy him, the girl doesn't notice that he is persuing her first of all but he is there helping her find ways to get away from the monsters, as we reach different chapters and checkpoints in the game we get closer to helping the girl and letting us know we are there, there are 8 chapters in all and they each are a lead up to the little boy and little girl being able to work together to get to where they need to go. 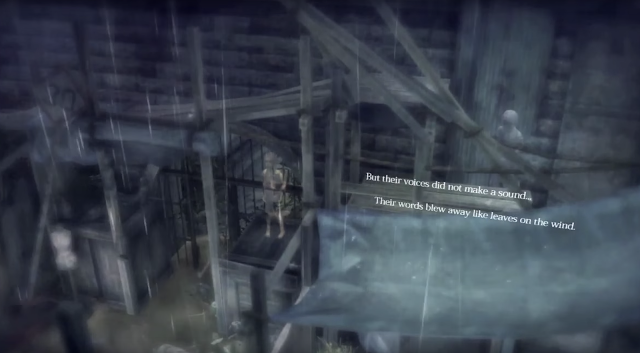 I found some of the puzzles like missions hard at times but once I started to get into the game and stopped using the hint button I was able to work out what I needed to do in order to not be seen, the biggest reason why this game is called Rain is because the rain gives away your spirit form allowing the monsters to see you and get you, you have to hide in dry parts and find something over you head to shield you from the rain in order to hide, but sometimes even when you do this the monsters (espically the unknown) can get you. 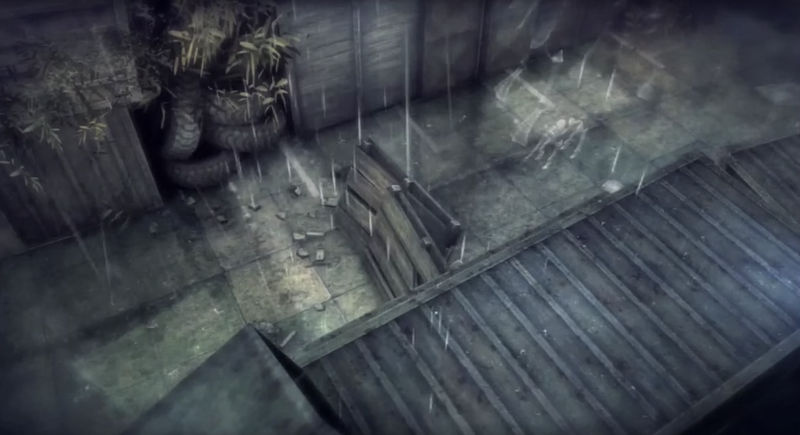 If you are into stealth games you would probably enjoy Rain, it's not exactly scary or makes your heart race but it does leave you with a sense of achievement when you escape the clutches of the monsters, I did feel a little uneasy each time the boy and girl were torn apart due to trying to escape but they always found their way back to one another, although there is no speaking in the game it's pretty easy to follow and you can enable subtitles, the music is what I listened to the most as it would warn me when something bad was near it set each scene in the game perfectly and was beautifully put together, it's one of those soundtracks you could just lay down and listen to whilst you slowly drift off. I was a bit put off by the fact that I couldn't pan the camera so I would find myself just running out or sneaking about to see what was near but I feel like they may have done this on purpose to build up the suspense, being able to use some enemies to your advantage in Rain helps the games machnics a lot too, there are these creatures called criters which you are able to get to attack other monsters, they destroy them by eating them I guess but you need to be fast and make sure they don't see you and get you when you run past them, I got killed a fair few times by the critters. Although this game was short it will be a game I would happily go back and play through again, I found myself very invested in what would happen to the children and not wanting any harm to come their way, the controls at time were annoying and took some getting used to but it's a quick and easy game, the trophies are the easiest to get, you get a trophy for each chapter you complete and one trophy for meeting up with the girl, once you finished the game you can play through the chapters again to collect 24 memories, by doing this there are 3 more trophies which you can collect. 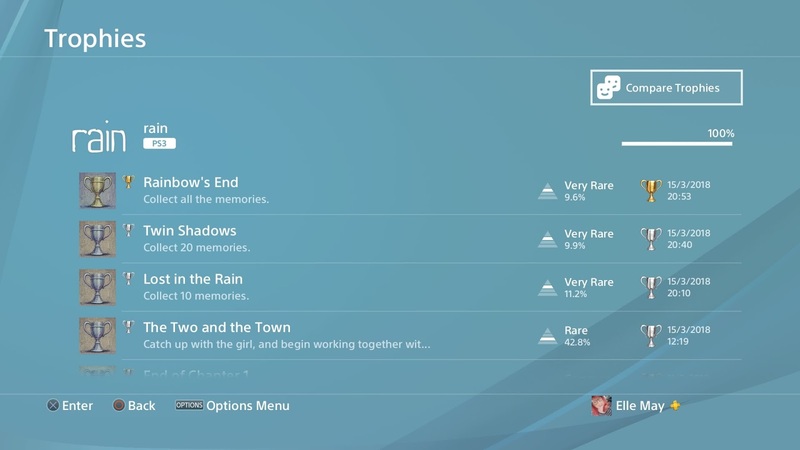 Unfortunately, there is no platinum trophy for this game, I would have thought there was with it being Plastation exclusive but I guess with it being so short and the game so easy to collect trophies there was no point. I give this game 4/5 due to not enjoying the controllers at times and the camera not panning.